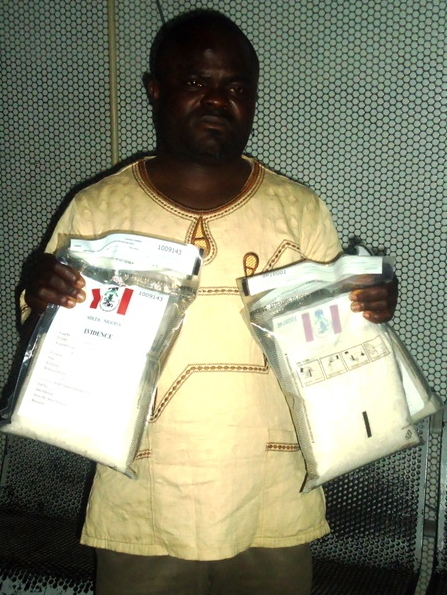 A South African-based Nigerian, Ayoola Adebayo, was arrested with 3.920kg of substances found to be methamphetamine. According to a statement by the spokesperson of the National Drug Law Enforcement Agency,Mr. Mitchell Ofoyeju, the suspect was arrested at the Murtala Mohammed Airport during the outward screening of passengers on an Ethiopian airline flight to South Africa. “A Nigerian living in South Africa by name Ayoola Ayodeji Adebayo was found in possession of 3.920kg of methamphetamine on his way to South Africa. The drug was found in a false bottom of his luggage while he was trying to check-in the luggage. The case is being investigated. “I am a grocer in Pretoria. I have lived in South Africa for over three years. I am married with two children. My friend in Pretoria asked me to bring two bags to him.” I have lived in South Africa for over three years. My friend in Pretoria asked me to bring the two bags to him. He bought my return ticket and gave me N150,000.